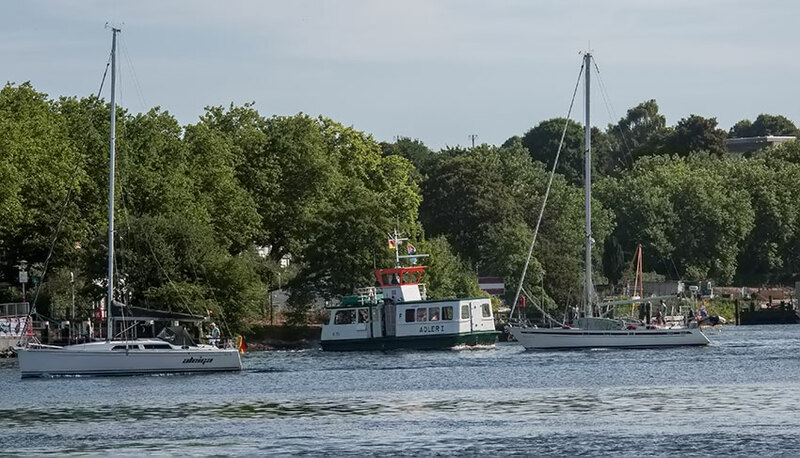 (German: Nord-Ostsee-Kanal, literally "North-[to]-Baltic Sea canal", formerly known as the Kaiser-Wilhelm-Kanal) is a 98-kilometre (61 mi) long freshwater canal in the German state of Schleswig-Holstein. 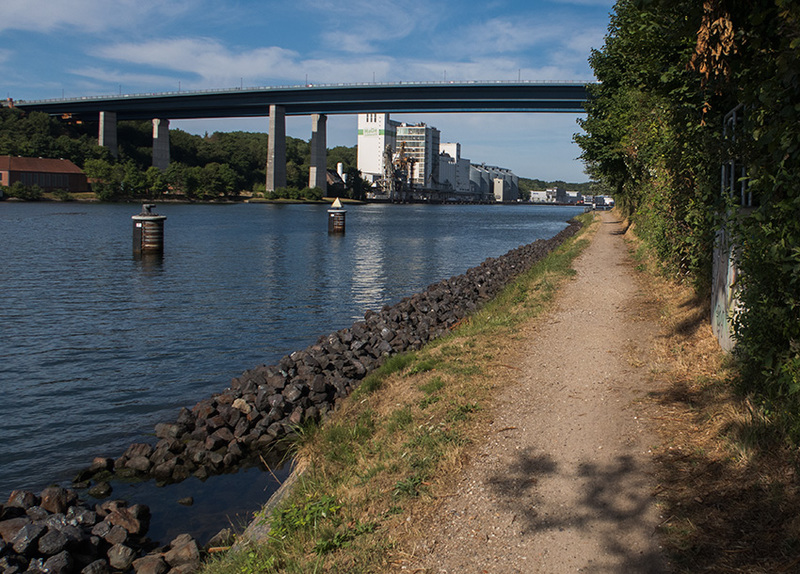 The canal was finished in 1895, but later widened, and links the North Sea at Brunsbüttel to the Baltic Sea at Kiel-Holtenau. 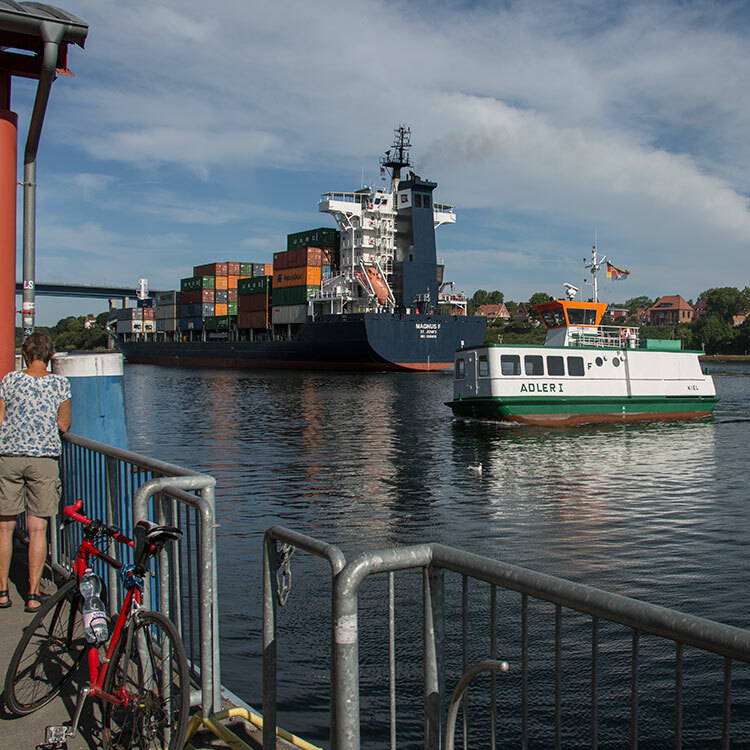 An average of 250 nautical miles (460 km) is saved by using the Kiel Canal instead of going around the Jutland Peninsula. 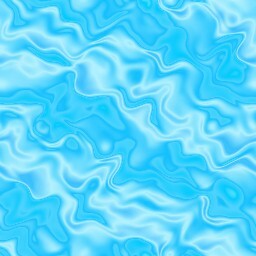 This not only saves time but also avoids storm-prone seas and having to pass through the Sound or Belts. The first connection between the North and Baltic Seas was constructed while the area was ruled by Denmark-Norway. 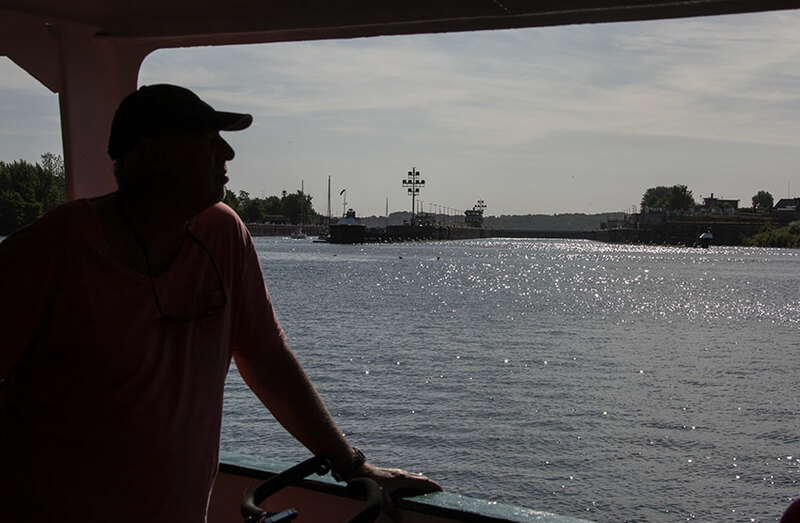 It was called the Eider Canal, which used stretches of the Eider River for the link between the two seas. 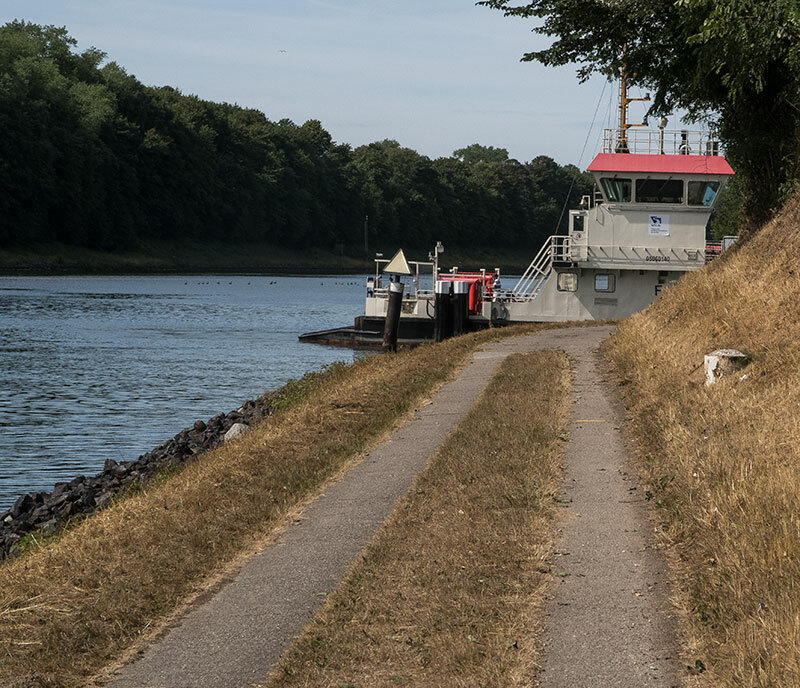 Completed during the reign of Christian VII of Denmark in 1784, the Eiderkanal was a 43-kilometre part of a 175-kilometre waterway from Kiel to the Eider River's mouth at Tönning on the west coast. 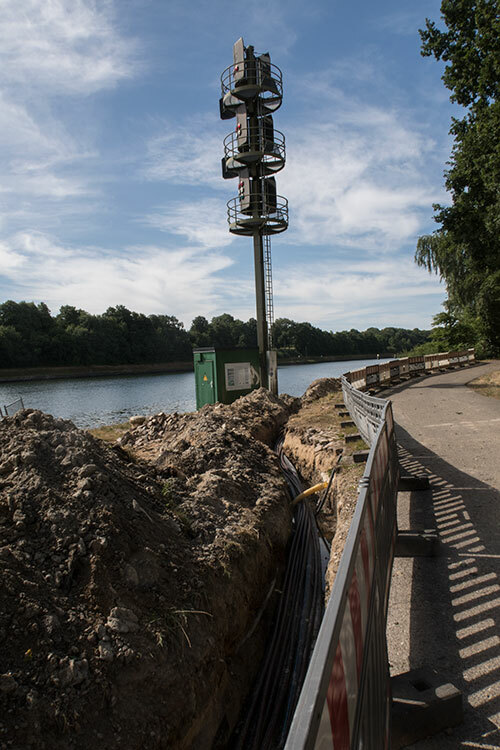 It was only 29 metres wide with a depth of 3 metres (10 ft), which limited the vessels that could use the canal to 300 tonnes. 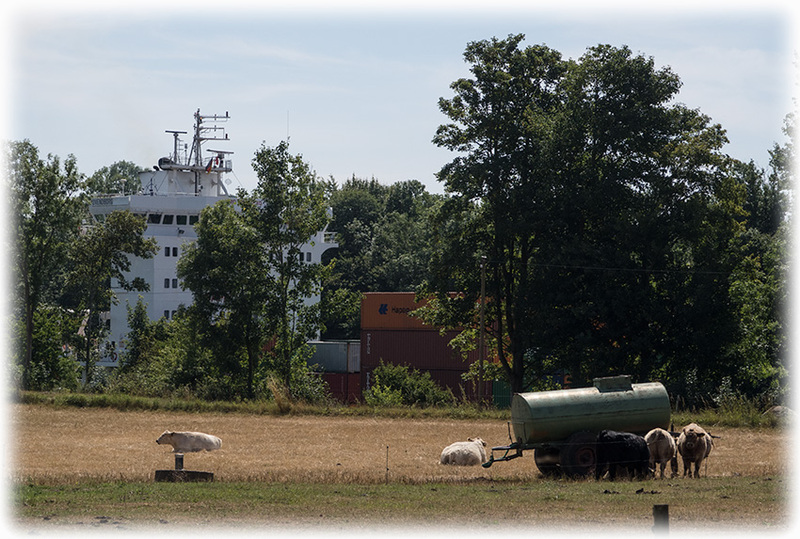 In June 1887, construction started at Holtenau, near Kiel. 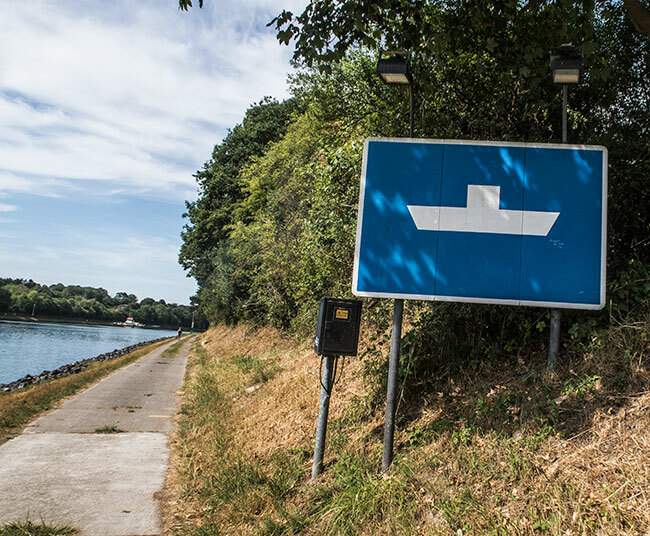 The canal took over 9,000 workers eight years to build. 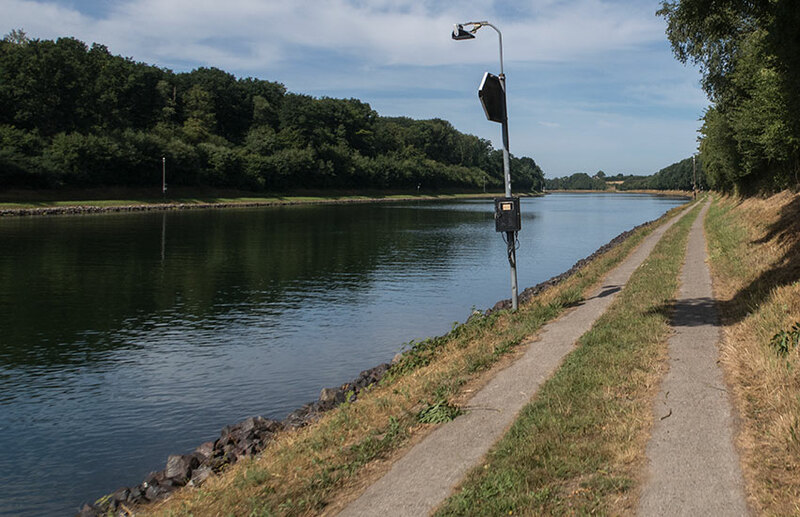 On 20 June 1895 the canal was officially opened by Kaiser Wilhelm II for transiting from Brunsbüttel to Holtenau. 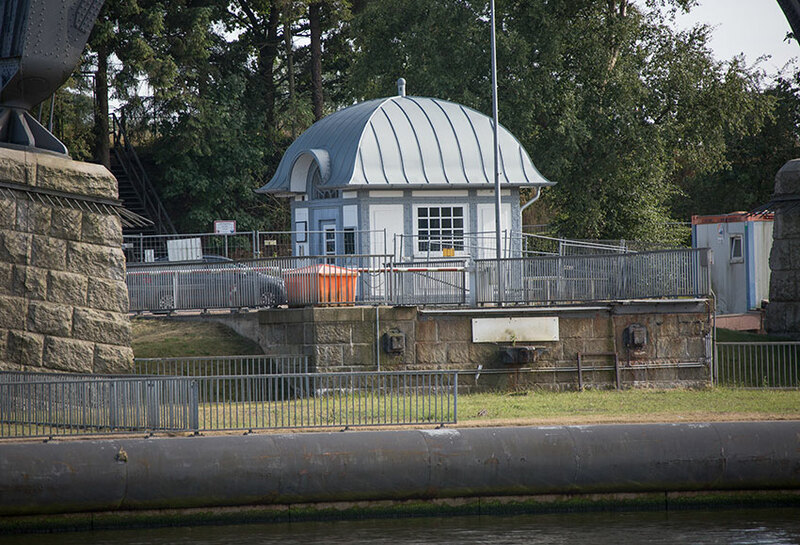 The next day, a ceremony was held in Holtenau, where Wilhelm II named it the Kaiser Wilhelm Kanal (after his grandfather, Kaiser Wilhelm I), and laid the final stone. The opening of the canal was filmed by British director Birt Acres; surviving footage of this early film is preserved in the Science Museum in London. 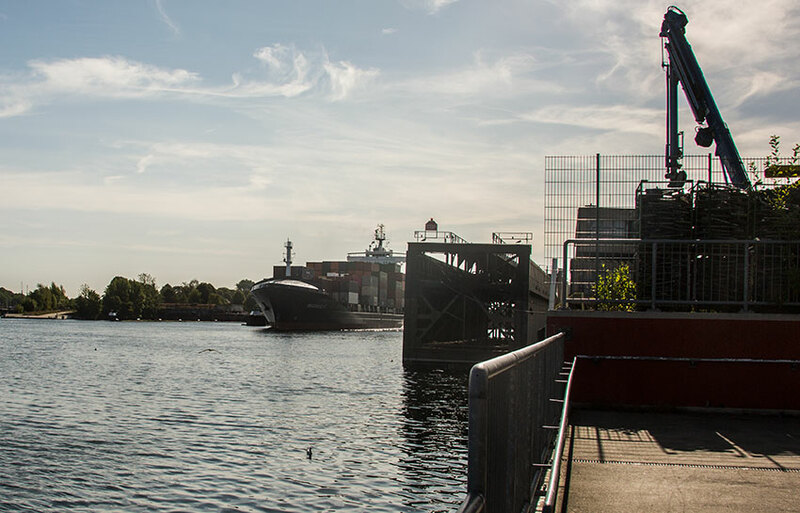 The first Trans-Atlantic sailing ship to pass through the canal was Lilly, commanded by Johan Pitka. Lilly. a barque, was a wooden sailing ship of about 390 tons built 1866 in Sunderland, U.K. She had a length of 127.5 ft., beam 28.7 ft., depth of 17.6 ft and a 32-ft keel. 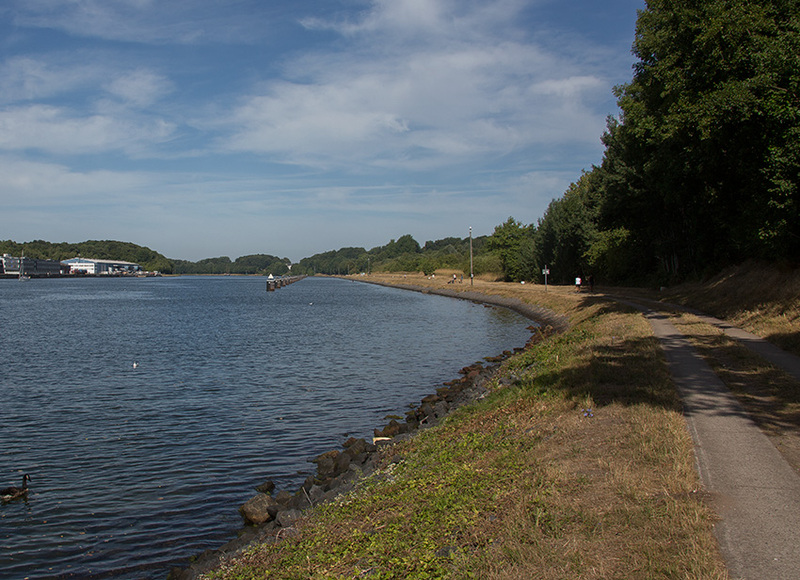 After World War I, the Treaty of Versailles required the canal to be open to vessels of commerce and of war of any nation at peace with Germany, while leaving it under German administration. (It must be noted here that the United States rejected this proposal because it would have given other powers – notably Great Britain and France – an excuse to seek similar concessions on the Panama Canal. Even pre–World War I Germany had floated such a proposal.) 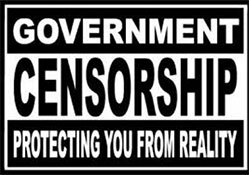 The government under Adolf Hitler repudiated its international status in 1936. After World War II the canal was reopened to all traffic. 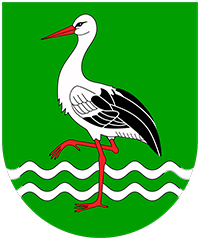 In 1948, the current name was adopted. 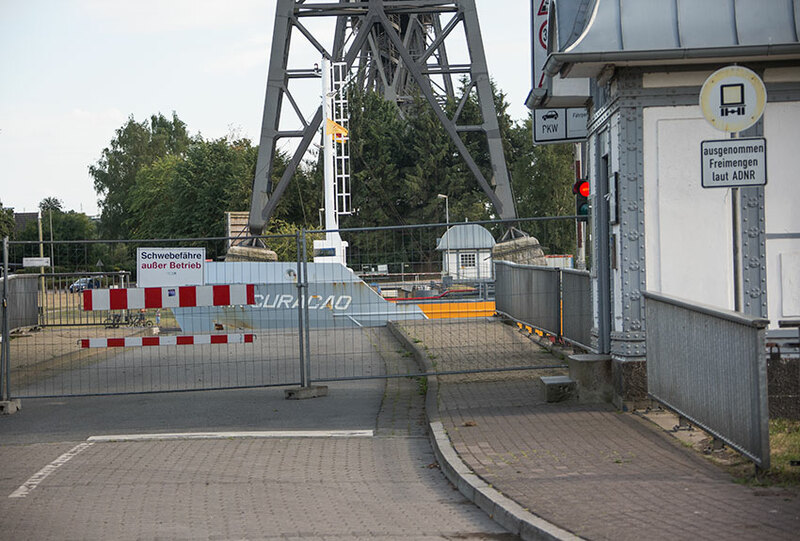 The canal was partially closed in March 2013 after two lock gates failed at the western end near Brunsbüttel. 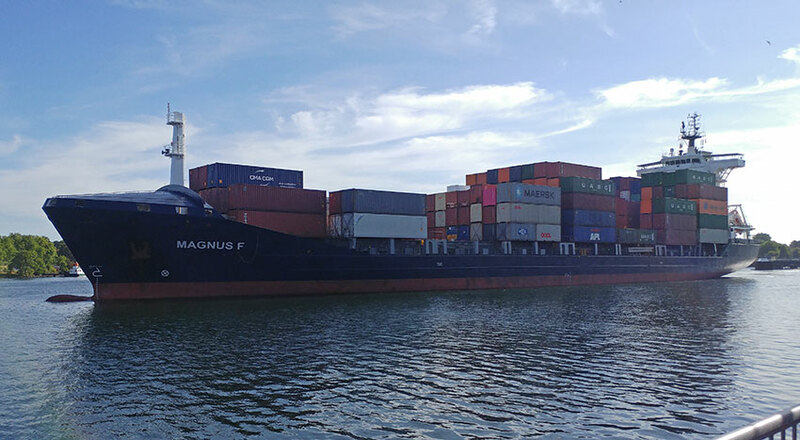 Ships larger than 125 metres were forced to navigate via Skagerrak, a 450-kilometre detour. 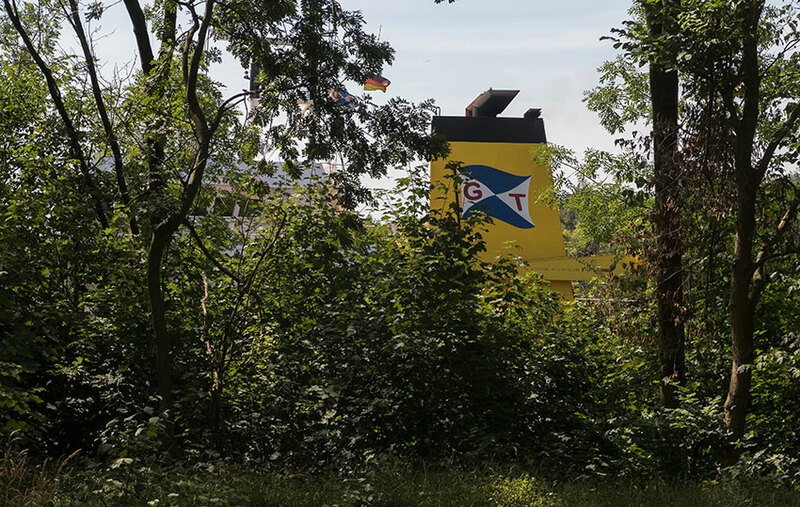 The failure was blamed on neglect and a lack of funding by the German Federal Government which has been in financial dispute with the state of Schleswig-Holstein regarding the canal. 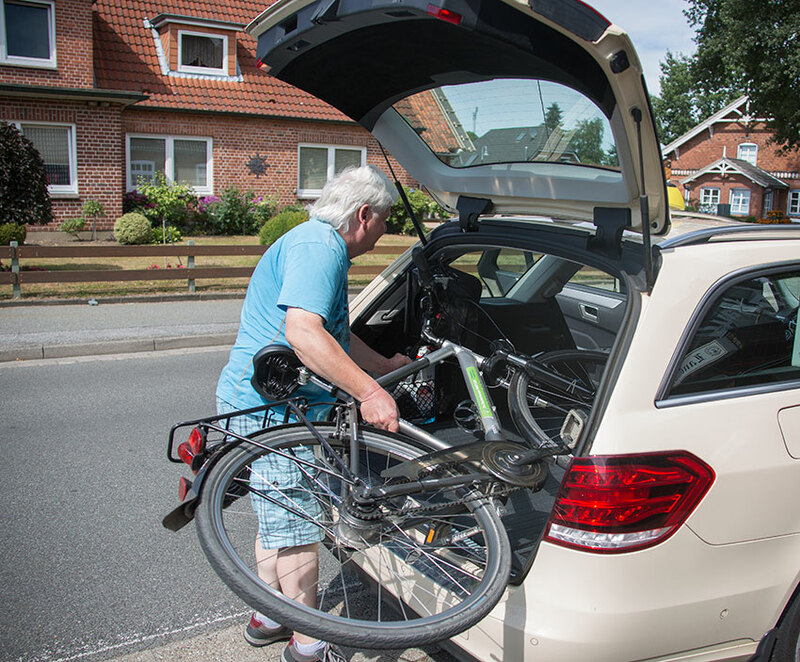 Germany's Transport Ministry promised rapid repairs. 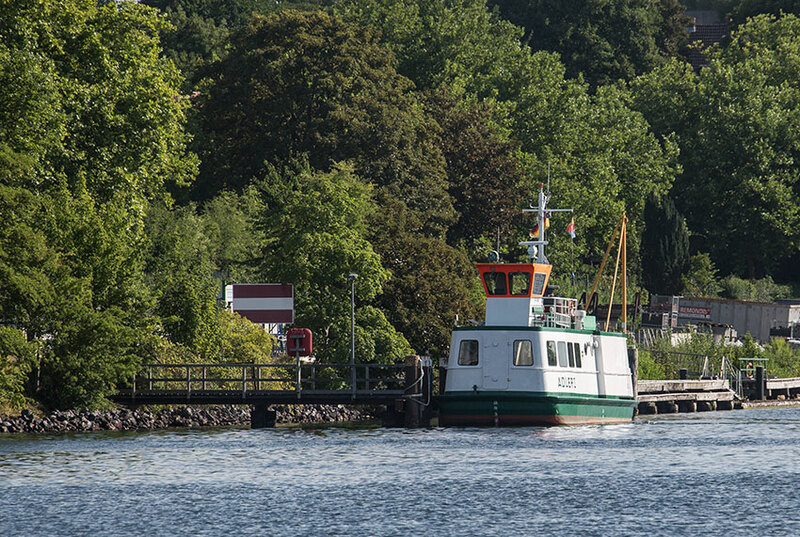 Sunday 29 th of July 2018 and I will start my adventure along the Kiel Canal. 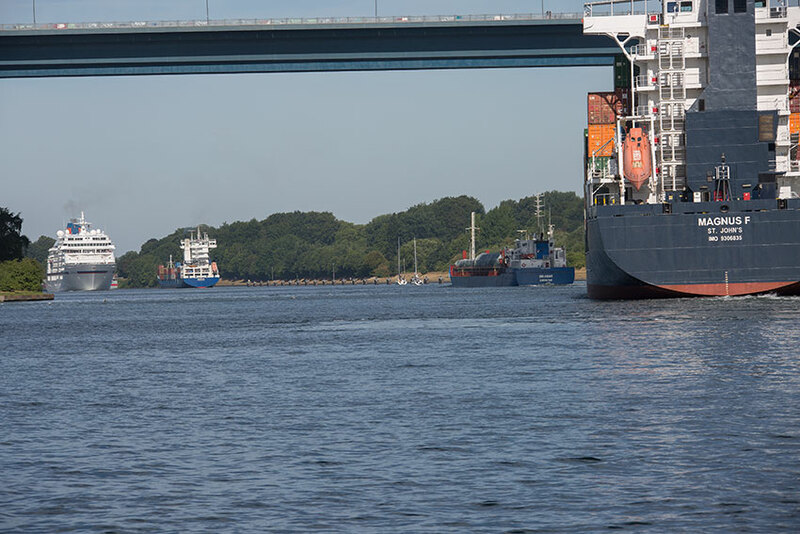 And if you want to know a little bit more about the Kiel Canal you can click HERE. 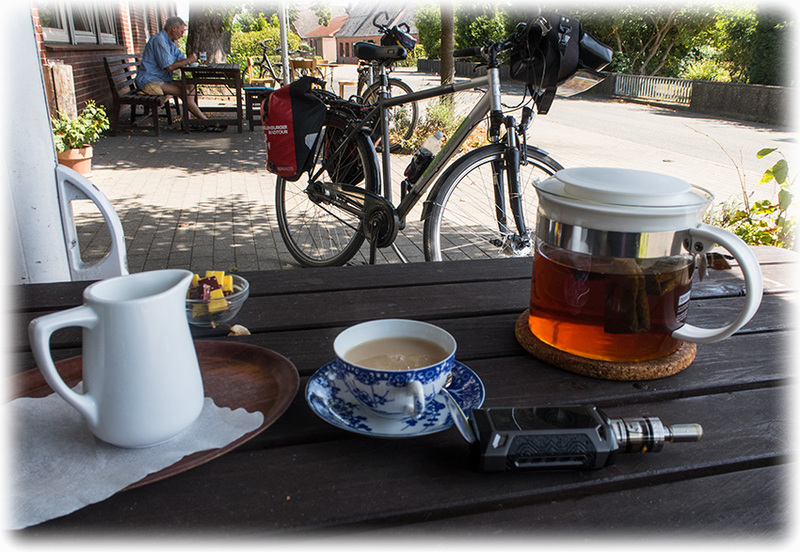 Anyway, today it is the first day of the bicycle holiday along the Kiel Canal. On the map below you will be able to see the different stages, day by day. My alarm went off at 4 o'clock and I was enjoying my blue berries and a pot of Earl Grey tea in my room. I have brought a box of Earl Grey tea from Sweden, just to make sure I get the real thing. Anyway, I went for an excellent breakfast at 6 o'clock and thanks to the blue berries I could not eat so much breakfast even if it was an excellent breakfast. I left Hotel Berliner Hof to go look for the European Herring Gull at the train station. 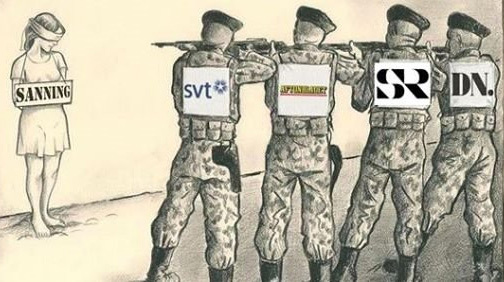 Så att det blir rätt! 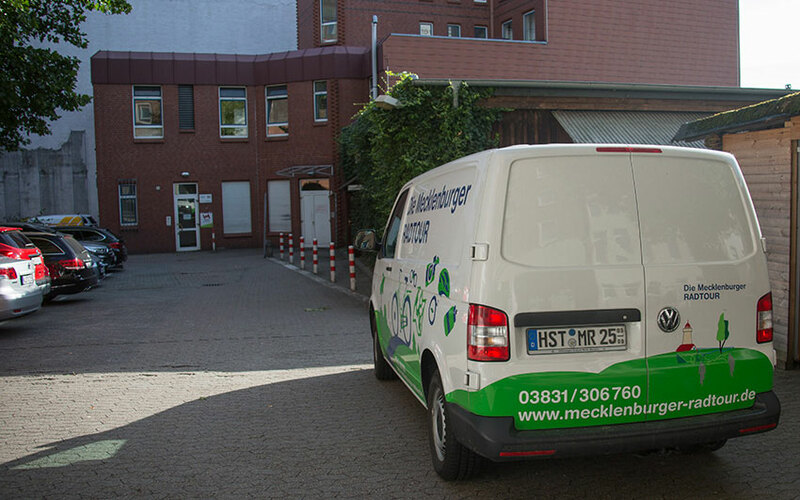 I get a few pictures of the Herring Gull and I walk back to the hotel where I meet the guy from Die Mecklenburger Radtour GmbH. He took my luggage and put it in his van. 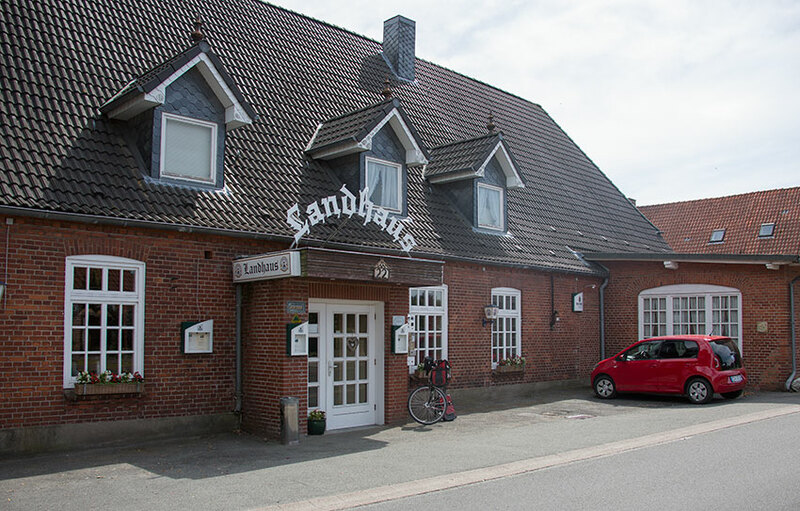 He will take it to my hotel in Rendsburg, Hotel ConventGarten where I will stay the night. I got my bicycle and some bags to hang on the side. I had problems to fit my camera but we managed to get the camera down in to the bad. I one more bag hanging on the back with water and some MAX I had a small box up front on the bar and I had my small camera in this box together with maps etc. 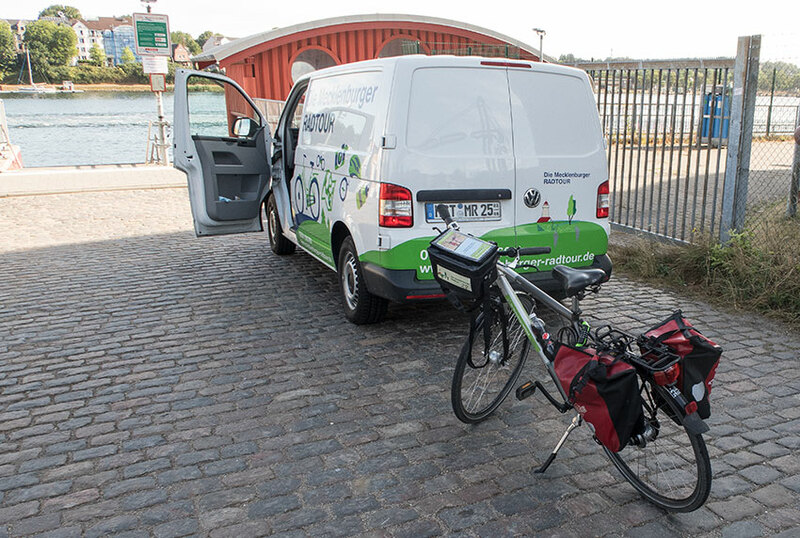 I told him that I didn't wanted to use the bike through the city and I asked for a taxi. 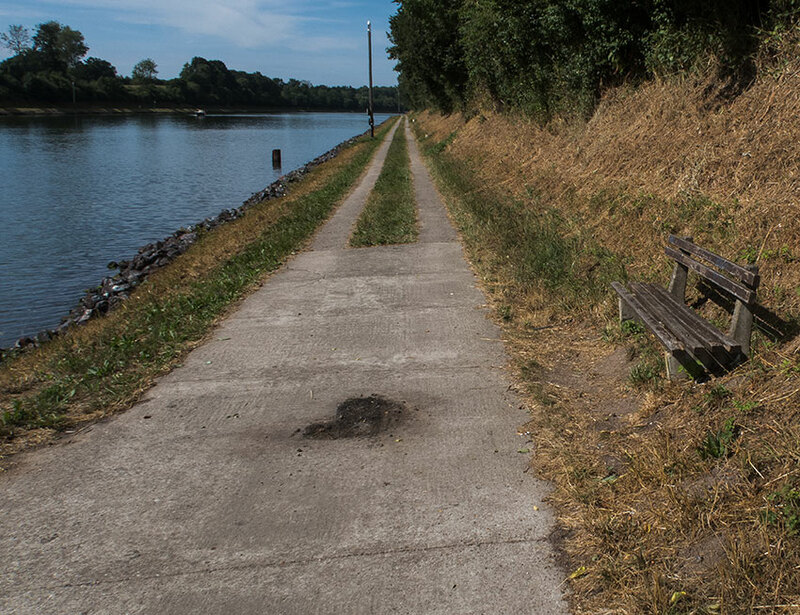 Well, he told me that he would bring me and the bike back to the Canal. I will cross the Canal with a very small ferry. 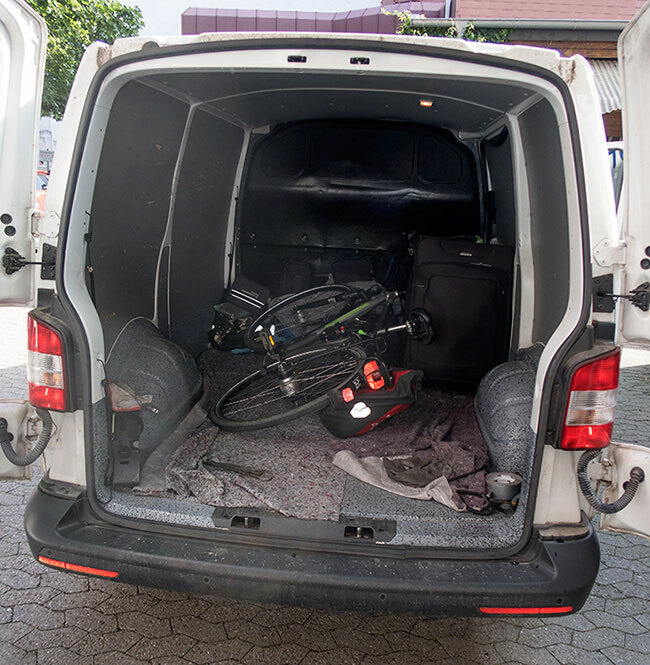 We loaded the bike in the back of the van and we left Hotel Berliner Hof behind bound for Holtenau. I say good bye to the driver and I went down the ramp to the ferry jetty. 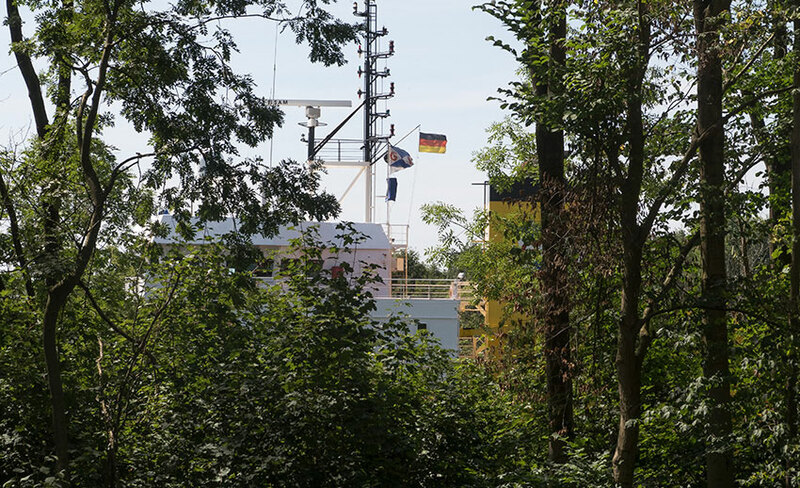 I took a picture of a ship leaving the lock in Holtenau. 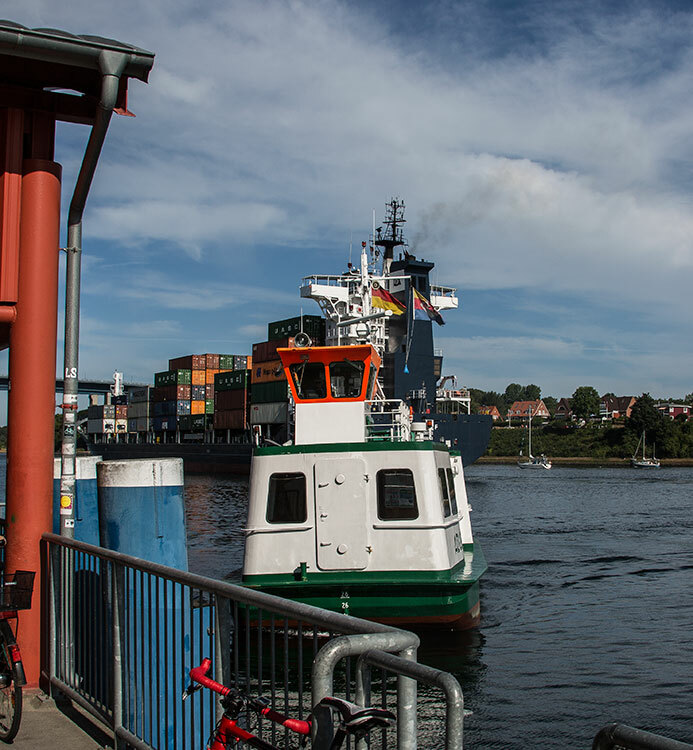 I took a picture of the ferry Adler 1 that will come to pick us up and bring us across the Kiel Canal. I also took some pictures of an European Herring Gull. 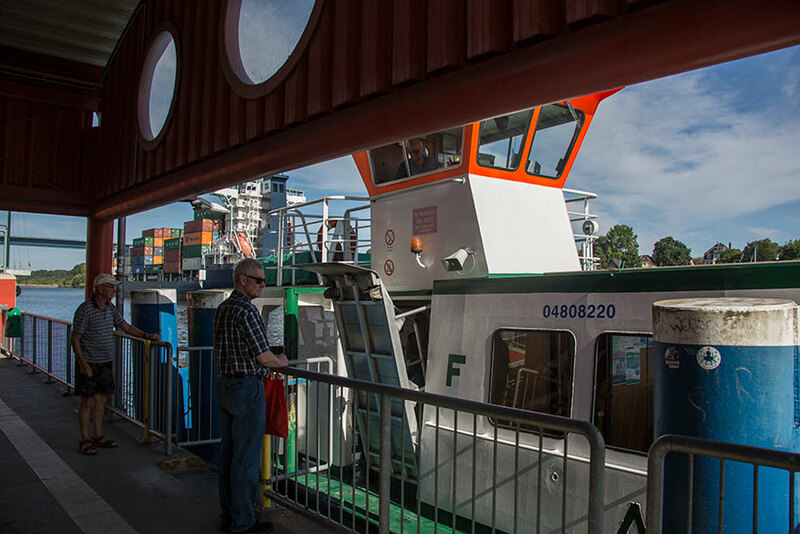 There were a few other people waiting for the ferry, among them the old couple that was on a tour along the Kiel Canal with Die Mecklenburger Radtour GmbH. I had meet them at the hotel when the driver loaded their luggage in the van. They arrived after me and they must have thought that I was a racer biker. The ferry arrived and we boarded the boat with our bikes. Half the ferry was dedicated for bikes. I was first to board and that means that I was last to get off the ferry on the other side. 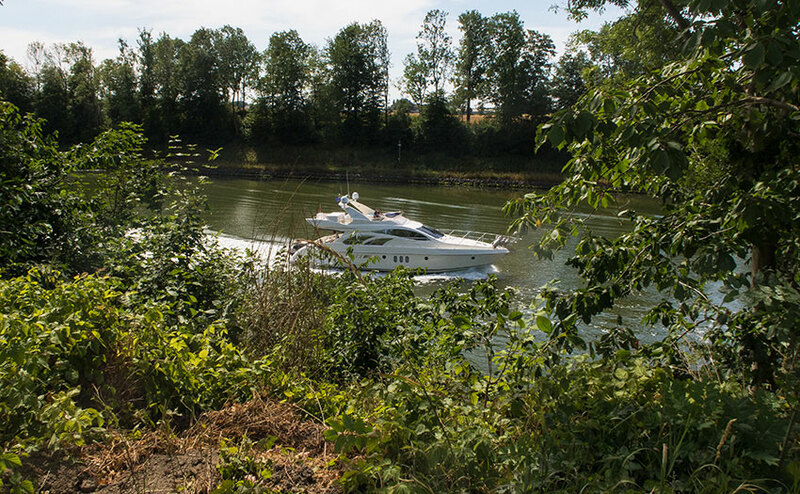 I was walking off the boat with my bike and I stopped on the path next to the Canal. My bike holiday can start. I got on the bike and I was biking for 5 minutes or so before I had to stop. 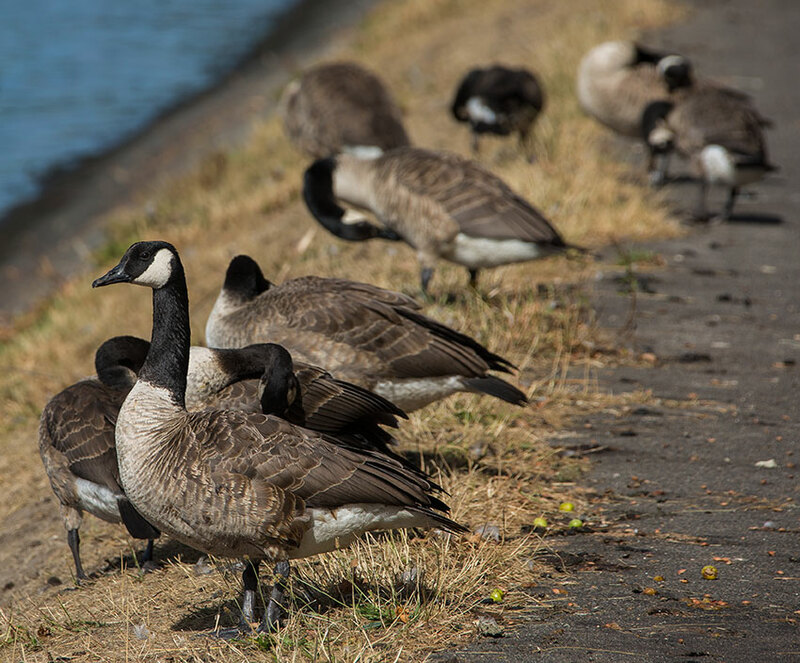 There were some Canada Gooses and I wanted to have pictures. Getting off the bike and going through the trouble getting the camera out of the bag. 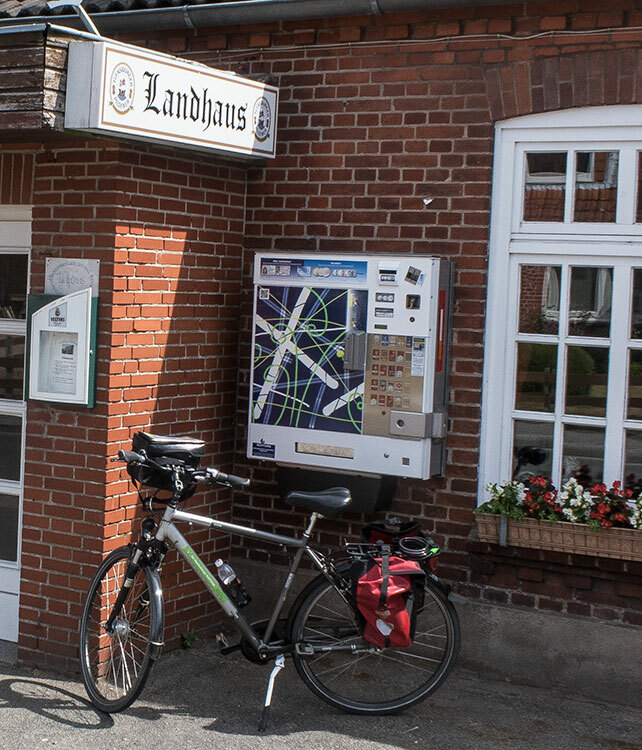 Now I can continue bicycling while taking pictures, thus no need to stop and I will be at the Hotel ConventGarten in Rendsburg in a good time. 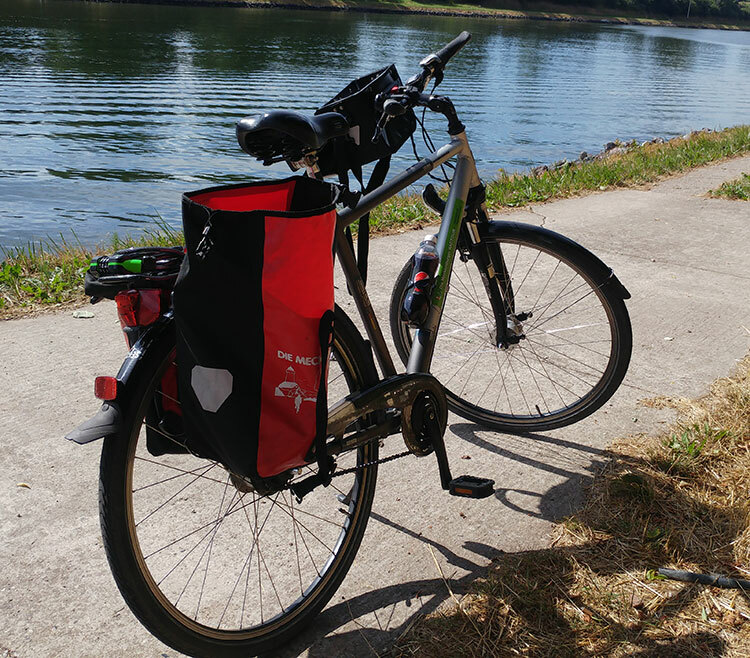 I was hauling arse and this bicycling thing is a nice thing. I sit down paddling along and I make 15 km/h just by sitting down paddling every now and then. I pass a bench and I decide to sit down to enjoy a MAX while enjoying the views. No ships passing and no birds so was soon on my way again. 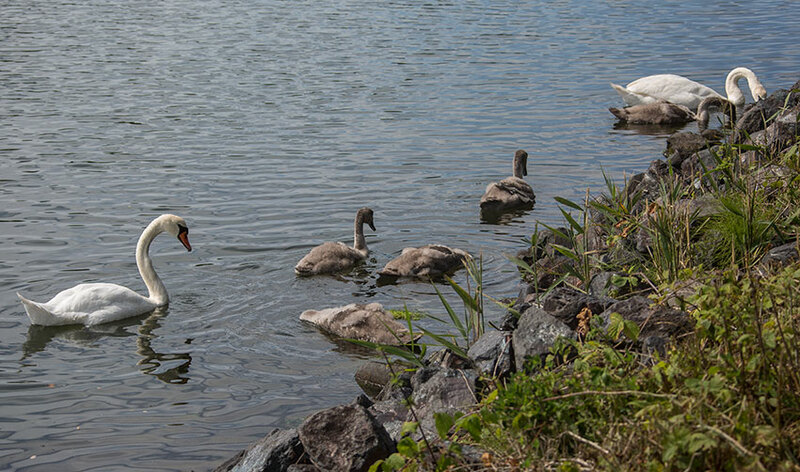 A few minutes later and I stopped to watch a swan family. They were swimming around eating sea weed enjoying themselves. I can hear many small birds singing in the trees, but I never managed to see any of them. 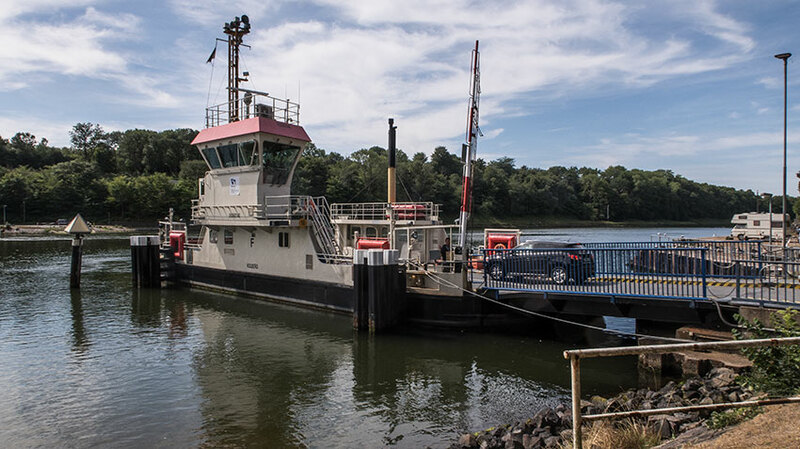 I was soon on the bike again and I reach a ferry jetty with one of the many ferries crossing the Kiel Canal. I had a few pictures but I never crossed the Canal. 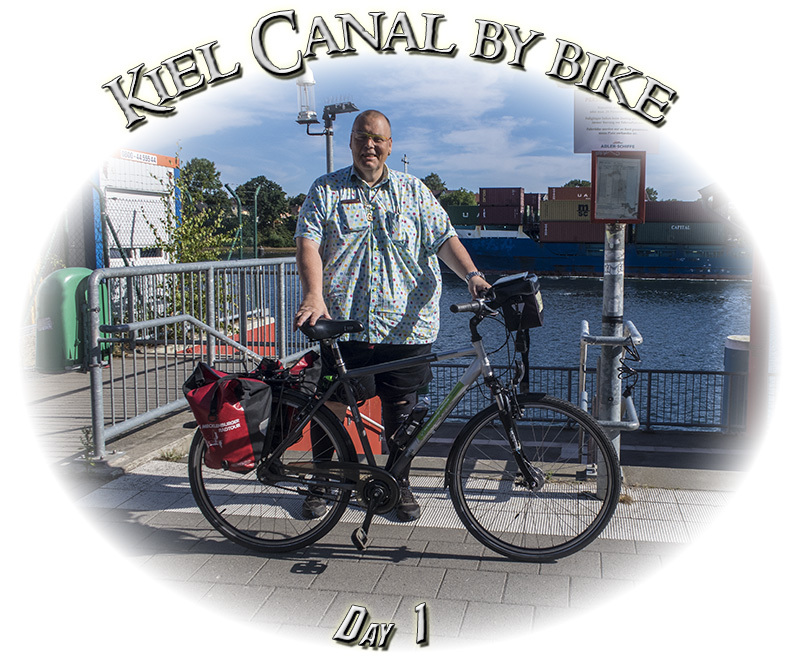 I have planned to cross the Canal a few times on the way back to Kiel as I will bicycle along the full stretch of the Canal. 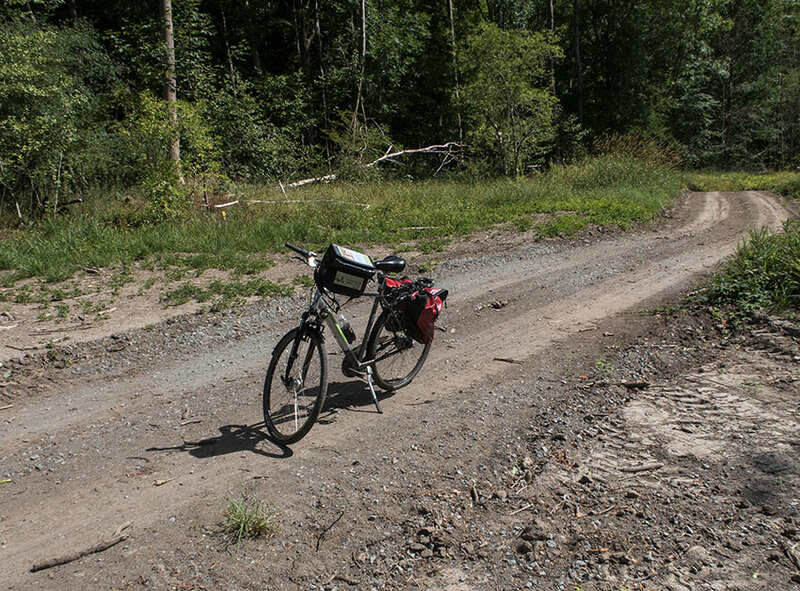 I had decided to take the short cut already when I got the map the very first time as I wanted to bicycle through the forest. 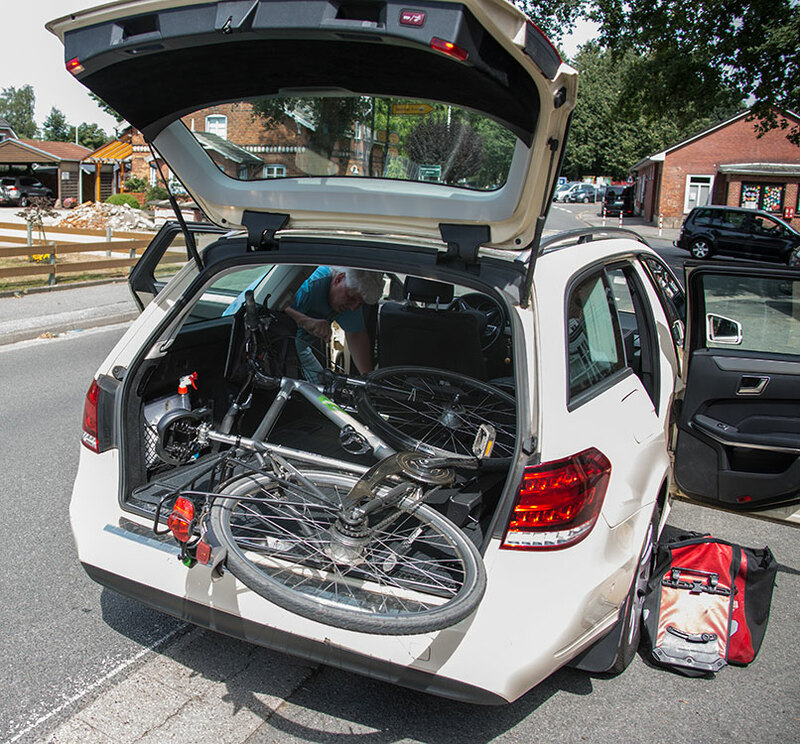 I had been on the bike for a few kilometres and my behind was starting to get sore. Coming up on the bumpy road was not doing any good for my sore behind. And I was starting to get hungry, and I was in the middle of nowhere. Consulting the map and no sign of any restaurant. The idea of a taxi started to form in my head. I left the forest behind and I was following a path along the pastures. 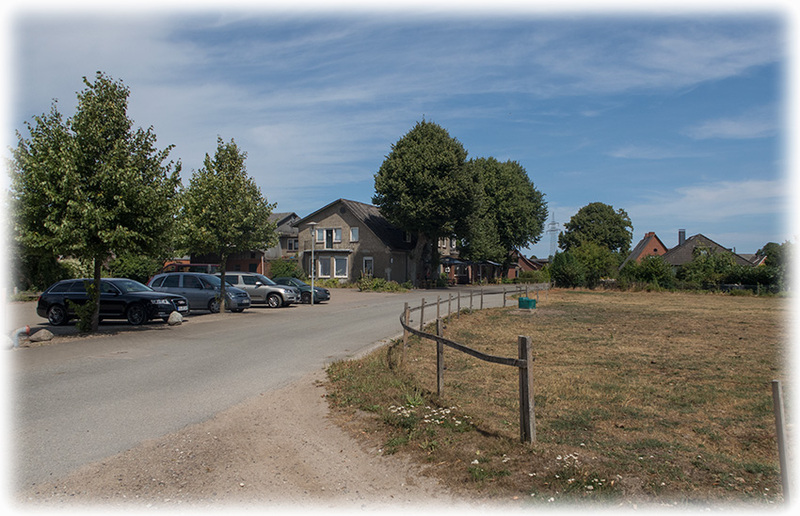 I reach the point where I join the original route and I have a small village on the right hand side. I was just about to continue when I spotted a parasol and I decided to check it out. Approaching the parasol and my hope grew, it was more and more looking like a restaurant. It was a restaurant and I stepped inside. They didn't accept any credit cards so I was very disappointed. But they told me that I could transfer money to their bank account. I ordered schnitzel and a pot of tea. I ordered a few sandwiches to bring with me on the bike. 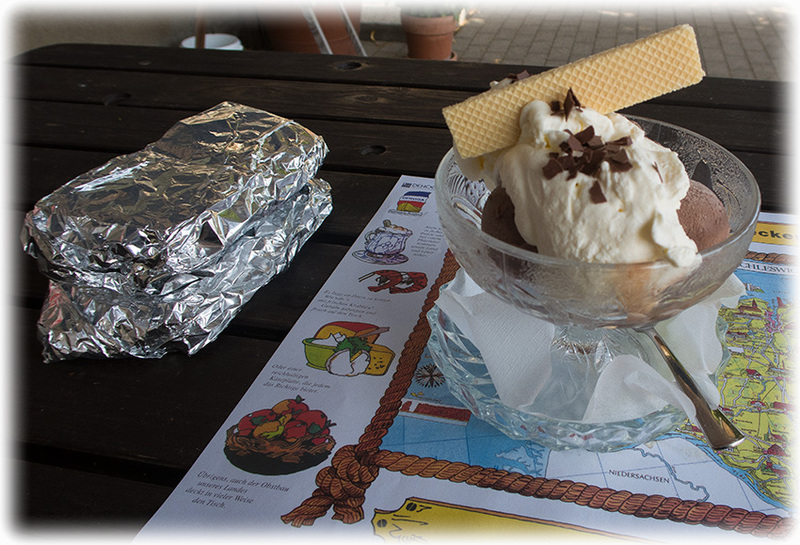 When I was ready I asked for ice cream. OH! 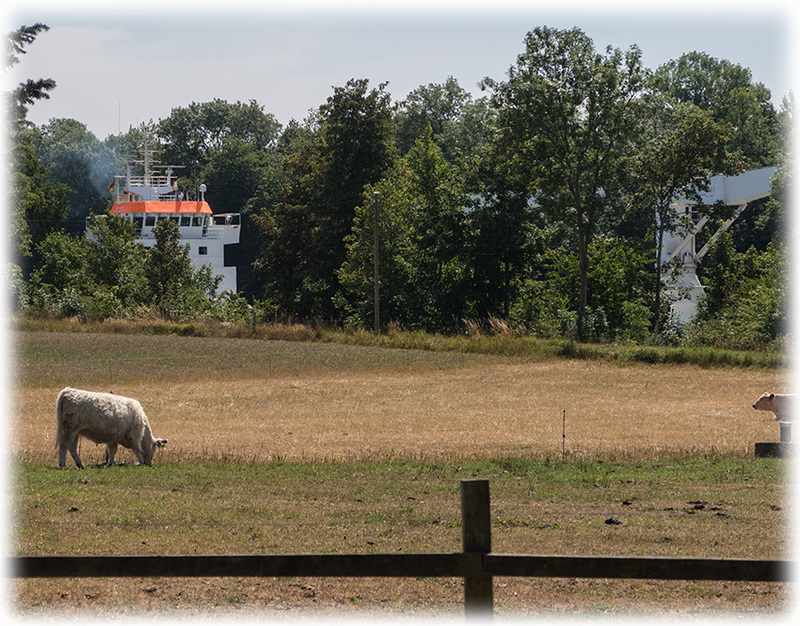 What a lunch it was, the food was excellent and I could enjoy the views and passing ships on the Kiel Canal. 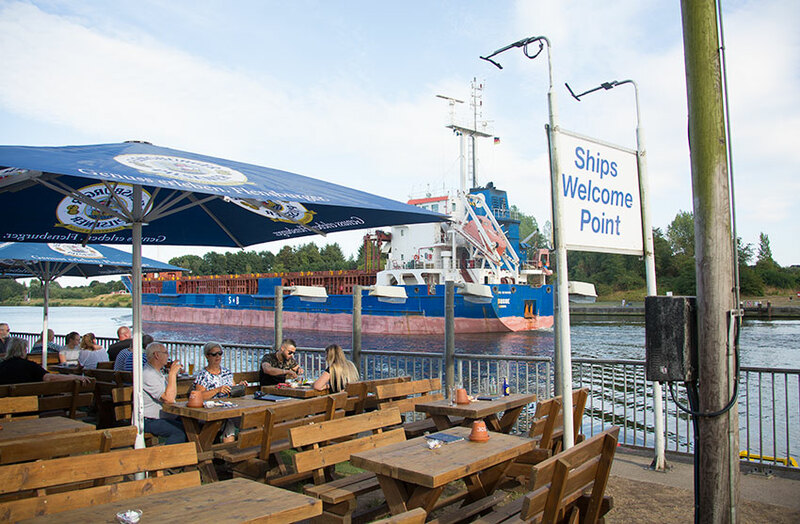 I told them that I would come back on my way back to Kiel. A few seconds later they came running to tell me that they would be closed in the beginning of August for holiday. 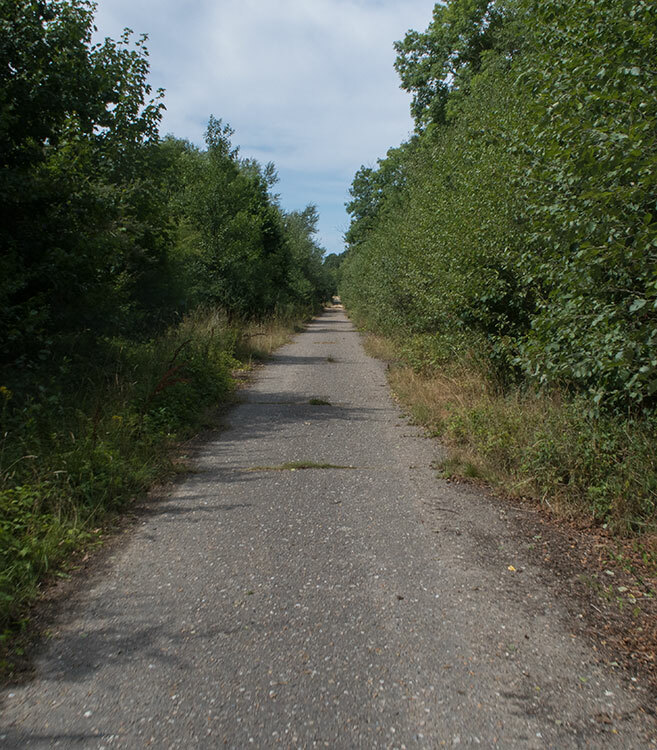 I continued paddling my bike towards Rendsburg and I was on a pretty tedious stretch through some bushland. I could not see the Canal, and I could for sure not see the end of the track. And it was a bumpy stretch and I was reminded about my behind. DARN! 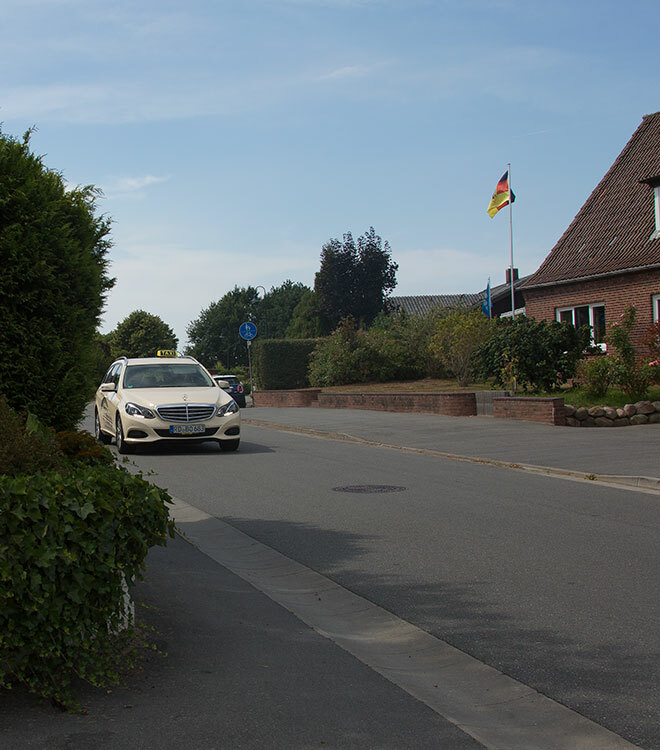 It was painful and I could not wait to get to my hotel in Rendsburg. When I look at the map I realise that I should have been keeping left to get down to the Canal. But I was going through the forest. 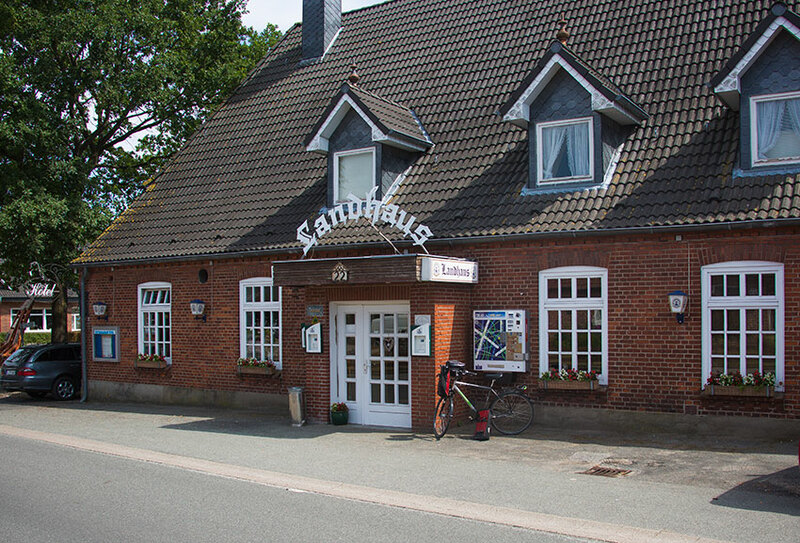 Coming out of the forest and I was in Sehestedt and I found myself on the road. The “Bike Route” signs pointed towards the road. 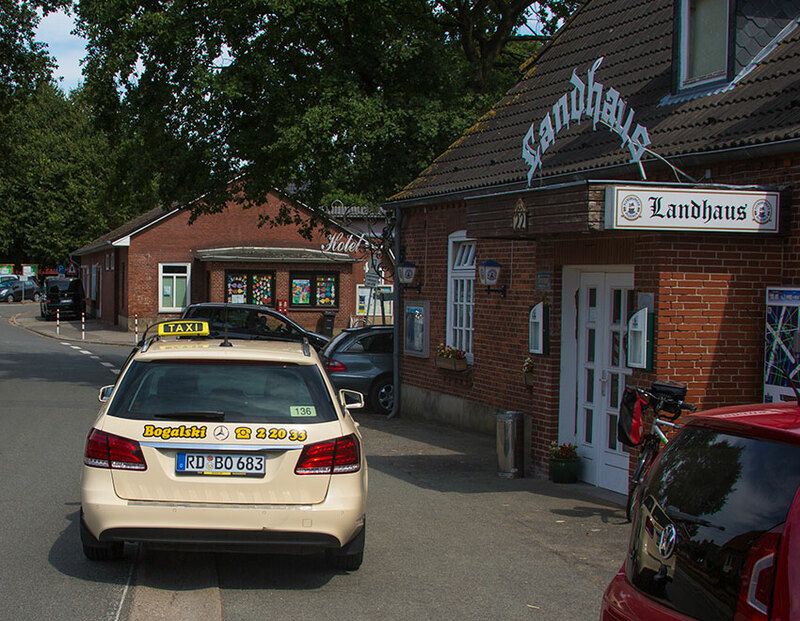 I didn't felt like biking along the road and I stopped to look for a place to call a taxi. 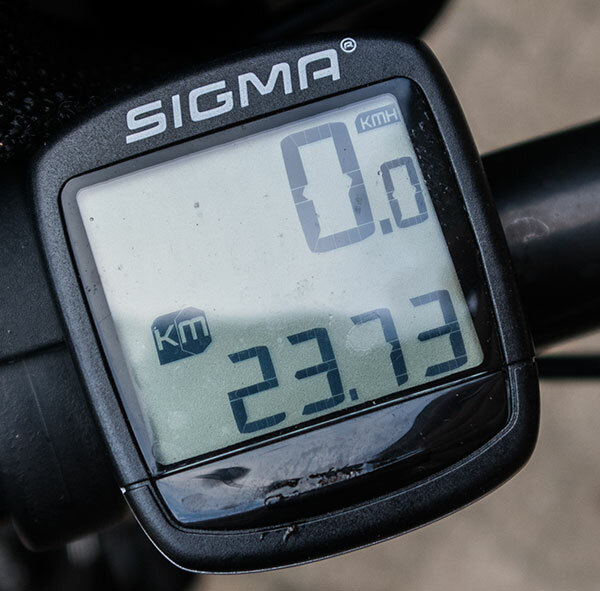 The meter on the handlebar showed 23.73 kilometers, enough for me (my behind) in one day. Can we get the taxi in to the taxi? 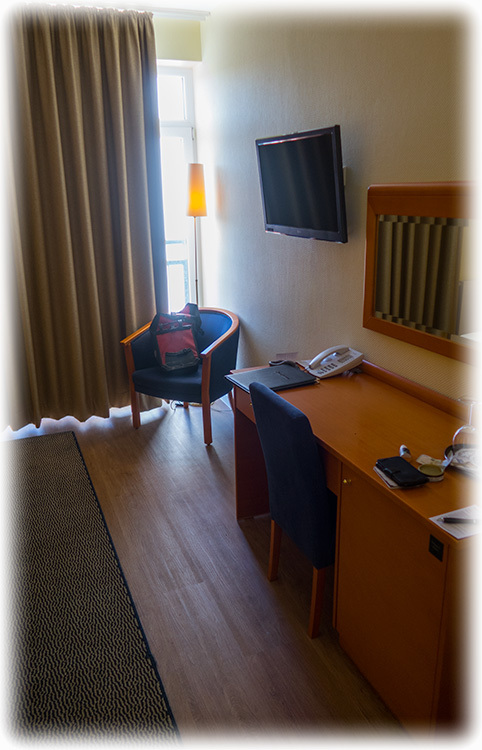 It was nice when we reached Hotel ConventGarten in Rendsburg. When I checked in they told me that my luggage was in the room already. Great! I went to my room and they would bring me a kettle and milk. I have my Earl Grey tea from Sweden with me. But darn, it was hot in my room. It was like a sauna as the sun had been pounding the room all day long. North Europe and there is no AC and one or two days of heat is nothing we can do anything about. But after 3 months heat wave they should at least have bought fans for the room. The room was nice, but the heat was not acceptable. Very bad! But it was a lovely staff and they arranged a kettle for me, even though you expect this from a room in this price range. I drink my tea and a MAX, yes, my luggage is full of Pepsi MAX and they bring it around Germany for me in the van. 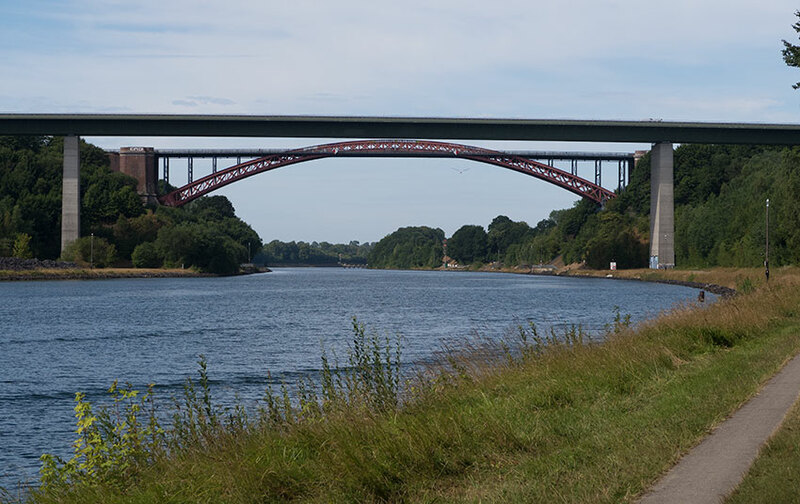 OK, one of the things I had planned to do already when I decided to do the “Kiel Canal by bike” tour was to cross the Kiel Canal with the ferry hanging in wires from the Rendsburg transporter bridge. 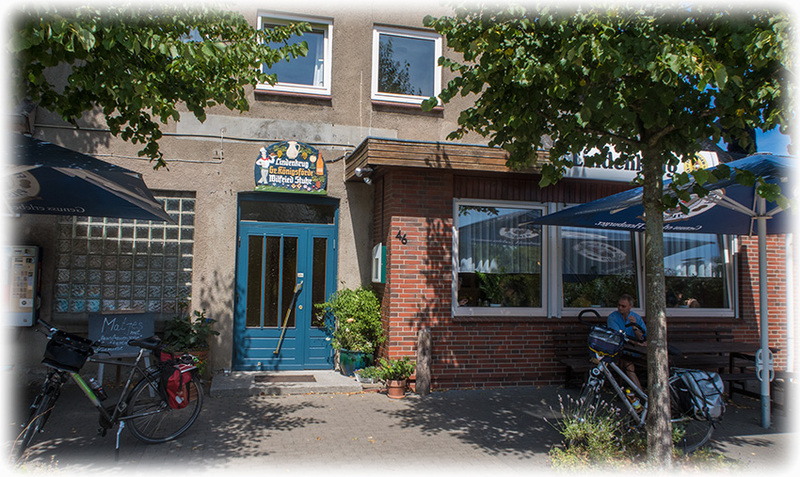 After crossing the river in the hanging ferry I would go to drink a soda at the restaurant under the bride, Brückenterrassen Restaurant und Café. Looking at the ships going by watching them greeting the ships by hoisting the flag playing the national hymn of the country of the flag that the ship flies. 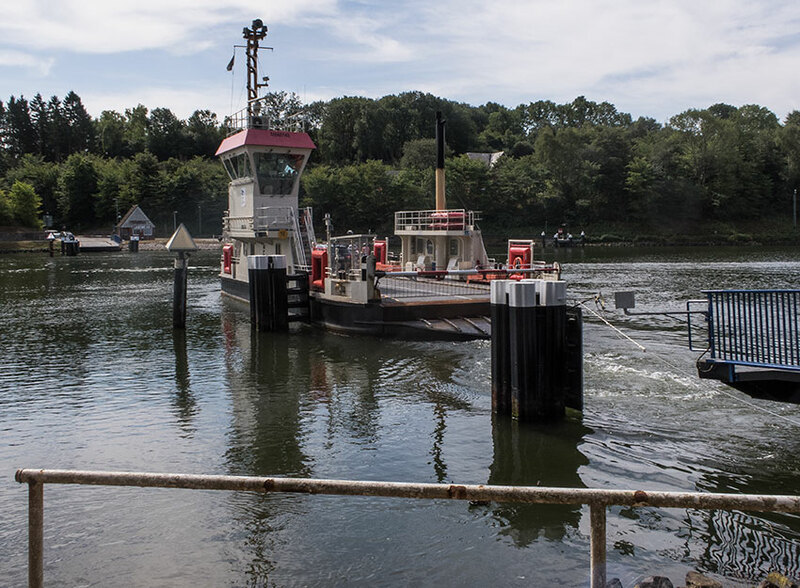 They called me a taxi from the reception and I was soon on my way towards the Rendsburg transporter bridge. I could not see the hanging ferry and I asked the taxi driver about the ferry. He told me that the ferry was hit by a ship. 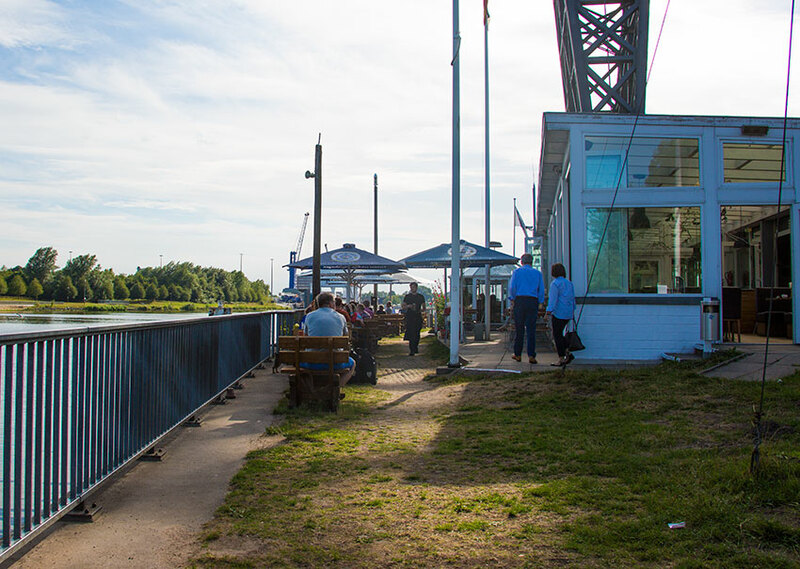 So this was a disappointment, I took a table at the Brückenterrassen Restaurant und Café, sitting just next to the Kiel Canal. I asked for 2 bottles of soda water. I left after 20 minutes, and after 20 minutes I had not seen any soda water or any ships passing. 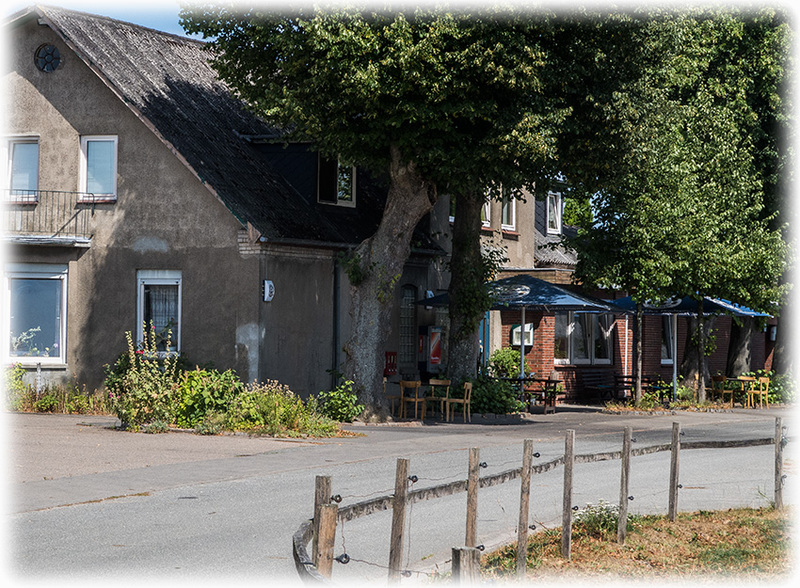 There was a ship passing when I left the place, but the only thing I got out of the visit to Brückenterrassen Restaurant und Café was a Carrion Crow looking for food at the parking place. I was looking for a taxi but no luck, so I had to walk back to the hotel.